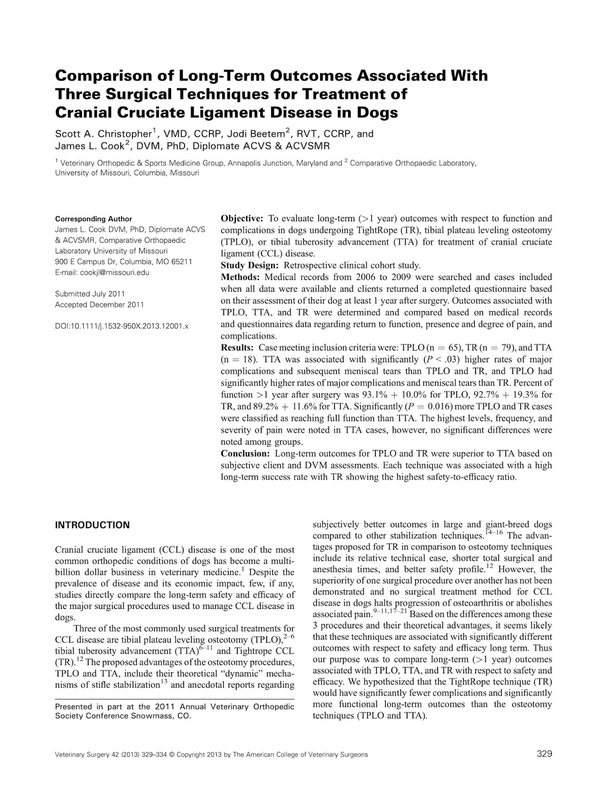 Comparison of long-term outcomes associated with three surgical techniques for treatment of cranial cruciate ligament disease in dogs. Christopher SA1, Beetem J, Cook JL. Vet Surg. 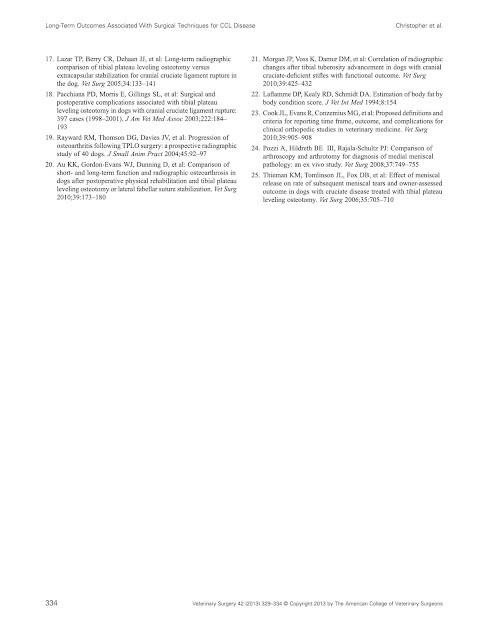 2013 Apr;42(3):329-34. doi: 10.1111/j.1532-950X.2013.12001.x. 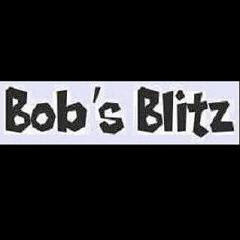 Epub 2013 Feb 21. 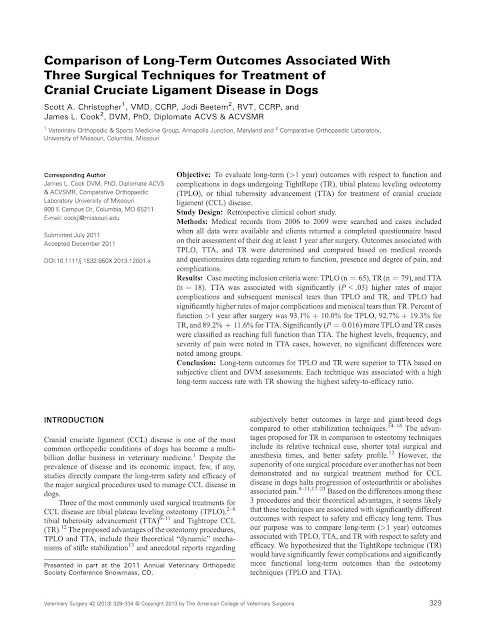 To evaluate long-term (>1 year) outcomes with respect to function and complications in dogs undergoing TightRope (TR), tibial plateau leveling osteotomy (TPLO), or tibial tuberosity advancement (TTA) for treatment of cranial cruciate ligament (CCL) disease. 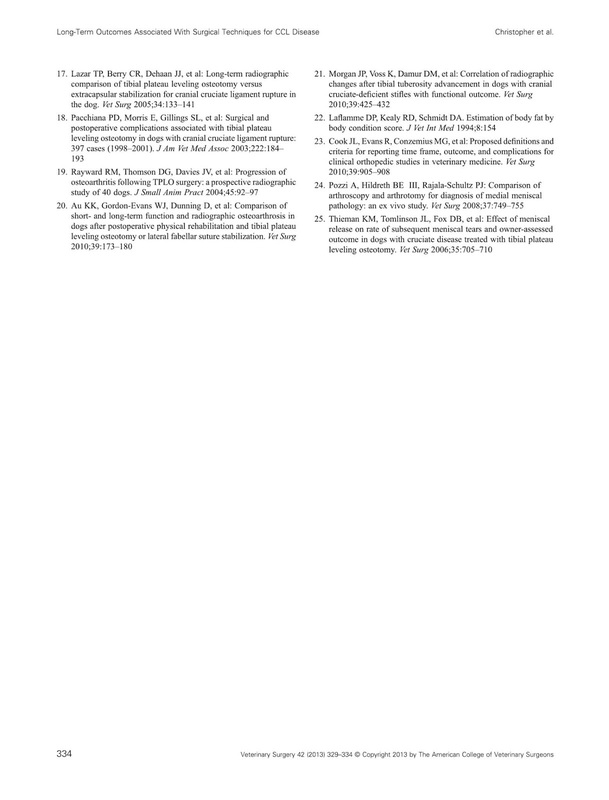 Medical records from 2006 to 2009 were searched and cases included when all data were available and clients returned a completed questionnaire based on their assessment of their dog at least 1 year after surgery. 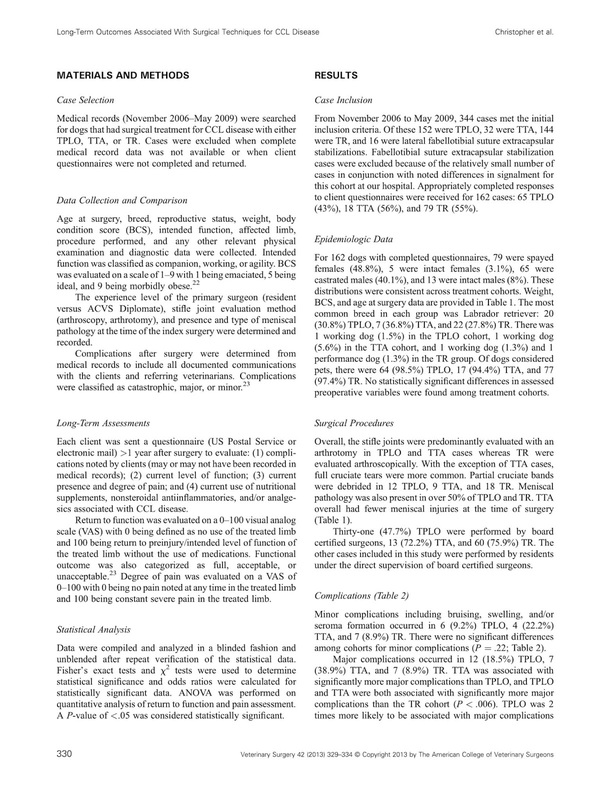 Outcomes associated with TPLO, TTA, and TR were determined and compared based on medical records and questionnaires data regarding return to function, presence and degree of pain, and complications. 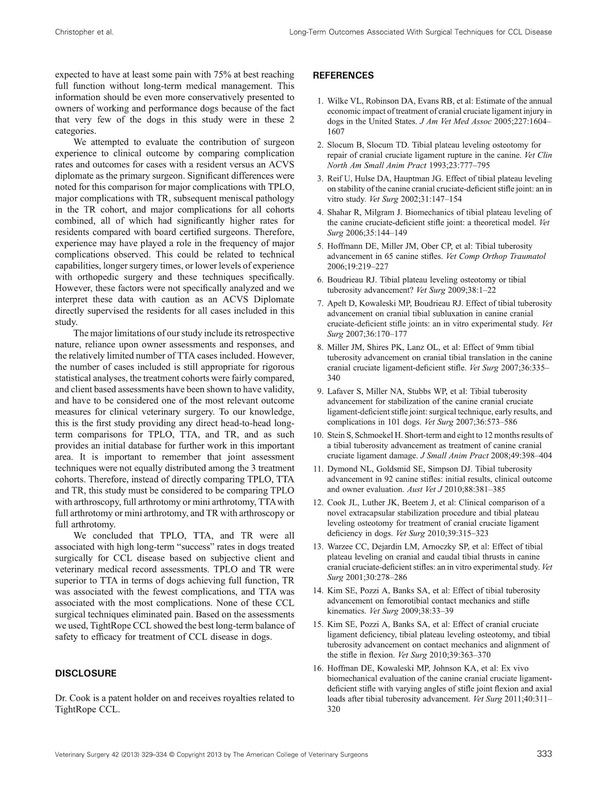 Case meeting inclusion criteria were: TPLO (n = 65), TR (n = 79), and TTA (n = 18). TTA was associated with significantly (P < .03) higher rates of major complications and subsequent meniscal tears than TPLO and TR, and TPLO had significantly higher rates of major complications and meniscal tears than TR. 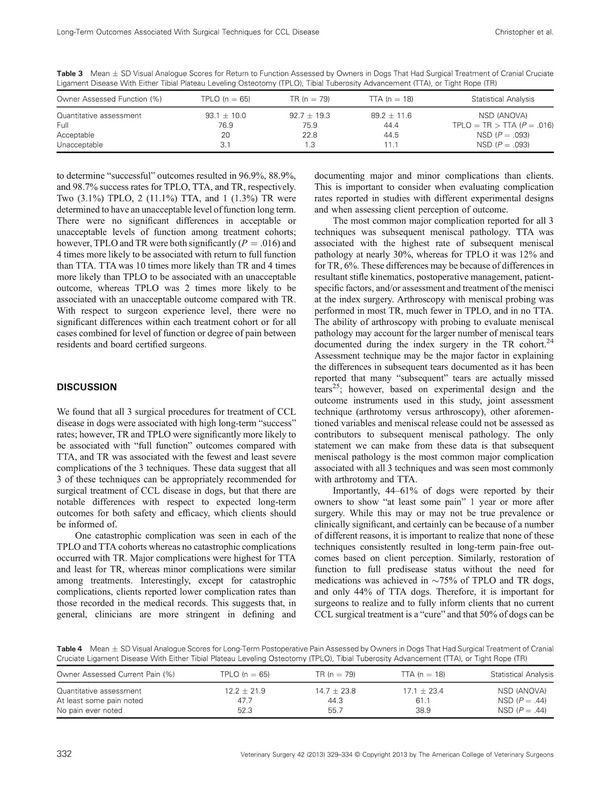 Percent of function >1 year after surgery was 93.1% + 10.0% for TPLO, 92.7% + 19.3% for TR, and 89.2% + 11.6% for TTA. 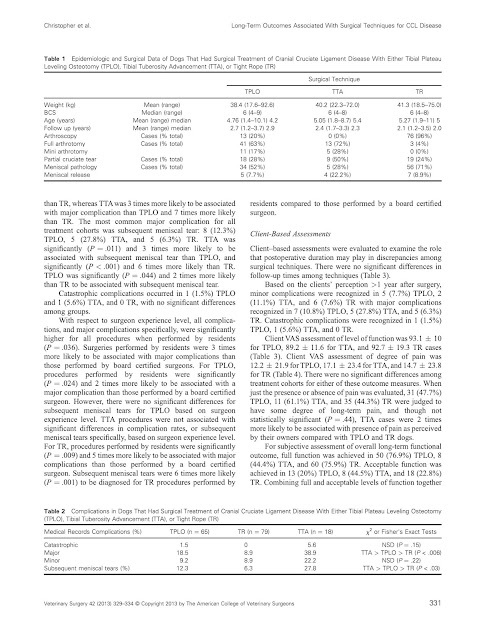 Significantly (P = 0.016) more TPLO and TR cases were classified as reaching full function than TTA. 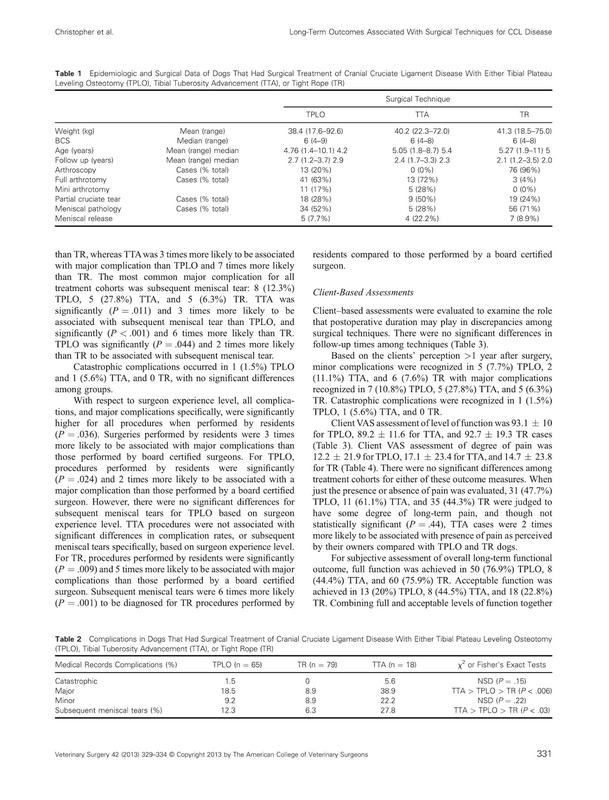 The highest levels, frequency, and severity of pain were noted in TTA cases, however, no significant differences were noted among groups. 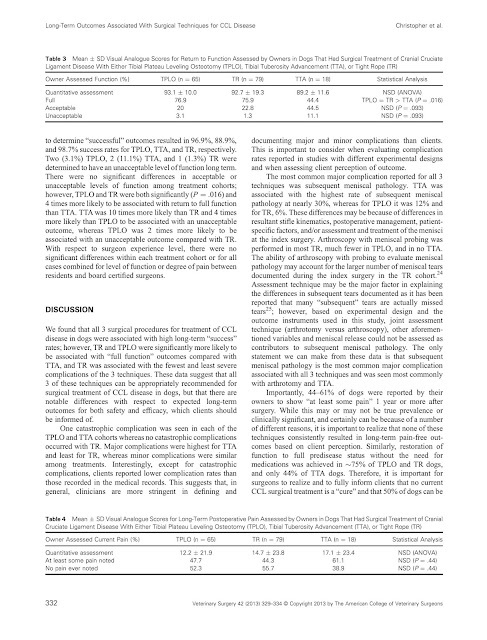 Long-term outcomes for TPLO and TR were superior to TTA based on subjective client and DVM assessments. 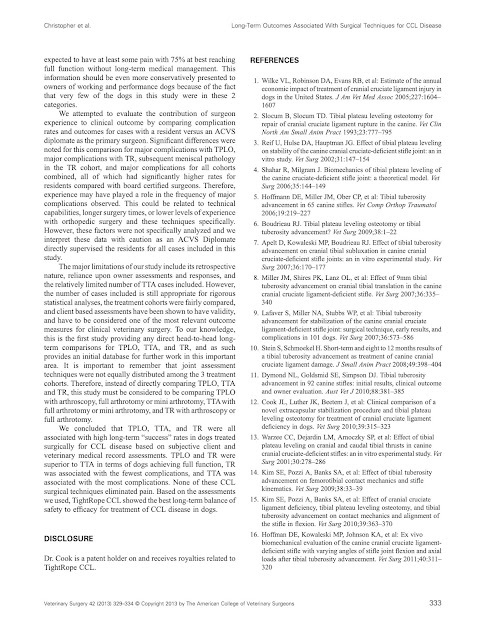 Each technique was associated with a high long-term success rate with TR showing the highest safety-to-efficacy ratio.